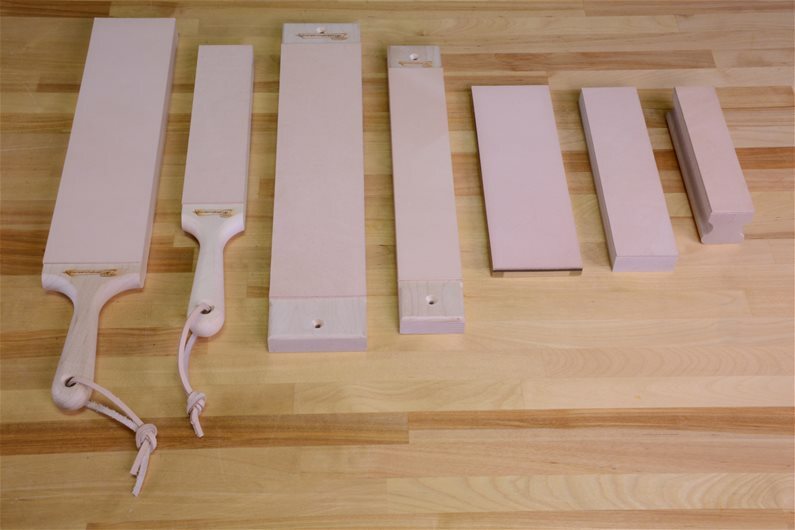 What are the differences between the various mounted strops? We offer several models of mounted strops. They are available in large and small sizes, hand-held and bench-mounted, as well as a variety of other options. We put together this article to make it easier to compare the different models. 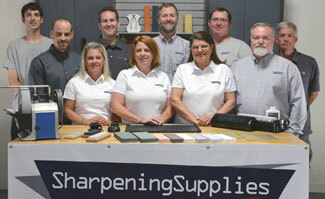 This photo shows all of our wood-mounted leather strops. The descriptions are listed below in order. 12" XL Double Sided Paddle Strop - a large strop with 2 stropping surfaces, each 12" long by 3" wide. One surface has Smooth Leather, the other Suede. This combination offers the sharpener flexibility. Put honing compound on one side and leave the other plain to create different surfaces for progressive stropping. The handle gives a secure hold. Our most popular strop and a great value! 8" Double Sided Paddle Strop - a smaller version of the 12" XL model, this strop also has two 8" by 2" surfaces. It offers the flexibility of both Smooth and Suede Leather in one strop, and has a generously sized handle like the 12" XL, but in a more compact overall size. 12" XL Leather Bench Mountable Strop - a large single sided strop with a surface of 12" by 3" that is available in your choice of Smooth or Suede Leather. 15" in overall length, the ends are pre-drilled with counter sunk screw holes making it easy to attach this sizable strop directly to a workbench. 10" Leather Bench Mountable Strop - a single sided strop like the 12" XL Leather Bench Mountable Strop, but with a stropping surface of 10" by 2". It is also available in your choice of Smooth or Suede Leather and has pre-drilled counter sunk screw holes for attaching to a workbench. 13" in overall length. Stone Topper Strop for 8" x 2" Stones - a single sided strop with a surface of 8-3/4" x 2-7/8" available in your choice of Smooth or Suede Leather. While the Stone Topper works well in almost any stropping situation, what makes it unique is that it is sized to fit on top of an 8" x 2" sharpening stone, making it convenient for use with this popular stone size. 8" x 2" Leather Bench Strop - has a surface of 8" x 2" and is available in your choice of Single Sided Smooth, Single Sided Suede, or Double Sided Smooth and Suede. This strop is mounted on a block of wood the same size as an 8" x 2" stone so that it fits in the Norton IM50 Bench Stone Holder as well as the 8" x 2" Wood Stone Case like those our Arkansas Stones come in. 6" Handheld Strop - a smaller strop designed to be held in one hand as you strop with the other. The thicker contoured wood block provides a secure handhold and allows the fingers of the hand holding the strop to be safely out of the way. This is a single sided strop available in your choice of Smooth or Suede Leather. The 12" and 8" Paddles Strops, as well as the Double Sided 8" x 3" and 8" x 3" Bench Strops have both a smooth and a suede side on the same strop. 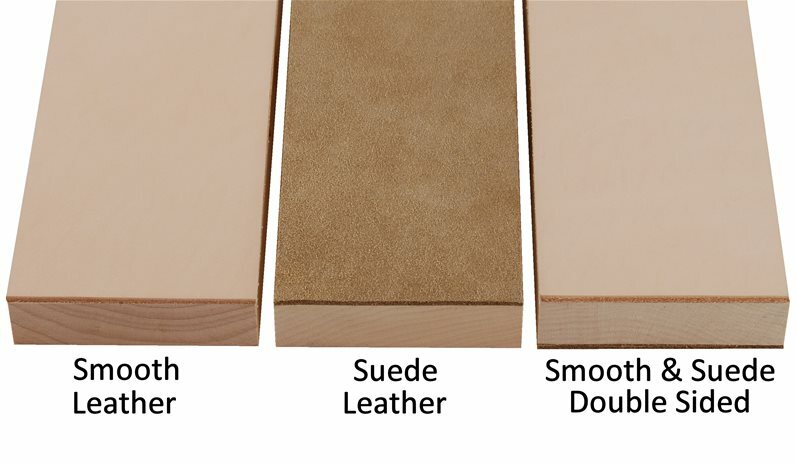 All other strops are available in either smooth or suede.